Urgh, dates. It’s always bloody dates. 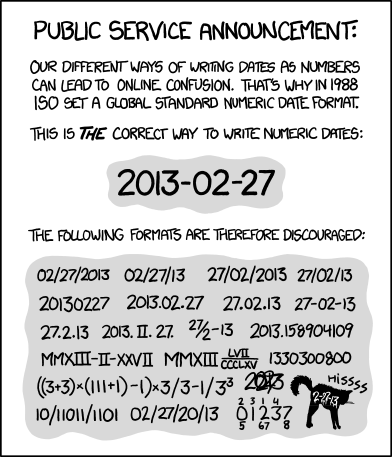 Whether it’s different time zones, localised formats (both long and short) or any one of a hundred other annoying little problems…somehow, whenever you start working with dates, everything goes to hell. If you are not already using momentjs for every date-related scenario then you are almost certainly wasting a lot of time. It’s under 6kb, it will do more-or-less everything you want with dates…go get it now. Admittedly momentjs makes this easier: you can parse the dates from the server using ISO format and then display them in whatever crazy format you want. Let’s take a look at how we would define that for our four components. jqPlot %B %#d, %Y Wait, what?! What’s going on here?! You can just about see how you could convert from the .NET format to momentjs, or even to the jQuery UI one without too much pain, but jqPlot is just a mess! After being plagued by numerous variations on this problem on a recent project, I decided to deal with it properly by creating something to translate between (theoretically) any 2 formats. This allows the convert function to create a mapping from one language to another, then use regular expressions to locate and replace matching tokens in the source string. The source code is available on GitHub along with the tests and some distributables. At the moment the library only supports 3 formats (.NET, momentjs and jqplot) as these were the 3 I needed most recently, but that list will expand over time - hopefully with some help from the community. This jsFiddle has a running example of the conversion so feel free to play around, or grab the source yourself from one of the links below. Full source That’s one fewer headache when you next find yourself stuck working with dates!